Why do we encourage clear game rules and boundaries? They create safe environments and provide opportunities for all students to join in play. When boundaries are unclear, games often collide, causing conflicts and disruptions. When game rules are absent (or too cumbersome or inconsistent), conflicts arise. When games stop due to conflicts, arguments arise, and students don’t feel welcome to join. To solve this problem, implement schoolwide rules and clear boundaries. 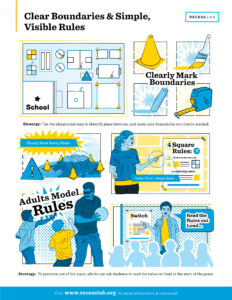 What are effective rules and boundaries? Effective game boundaries must be taught, practiced, and reinforced. Be sure to present guidelines visually and auditorially to meet the diverse needs of all learners. If your school does not have boundaries permanently painted on the ground, you can create them using cones, chalk lines, or paint. Good game rules are clear, simple, and limited to a few key rules. For rotational games, rules should also include a few actions that result in students cycling in and out. Rules should be consistent, meaning that the same rules and consequences apply throughout the school. This way, adults and students are held to one set of fair, inclusive standards. Clearly communicate and reinforce rules. By posting rules on cones, walls, fences, or A-frame signs, we make them available to students when they are needed, like at the start of games or when there’s a dispute. When an adult or a student leader is asked to help resolve a dispute, they can reference the posted rules. Be sure to include pictures for emerging readers. Reference your playground map to inventory your recess games and identify the game stations (i.e., which games are being played where). If you don’t have a playground map, see the “Map your Playground” resource on Recess Lab to get started. Write up to three actions that would send a student to the recycle line. Laminate and post the sign next to its relevant game station. 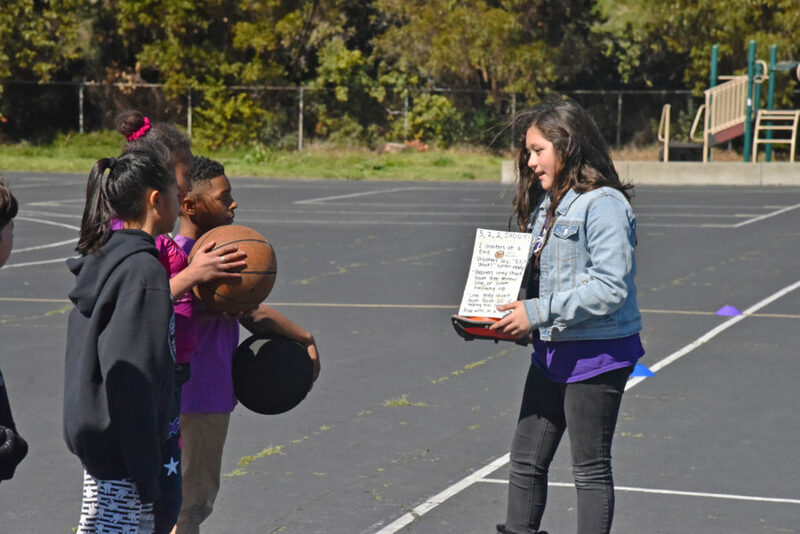 To promote the use of the signs, adults can ask a student to read the rules out loud at the start of the game. Be sure to include pictures for emerging readers. 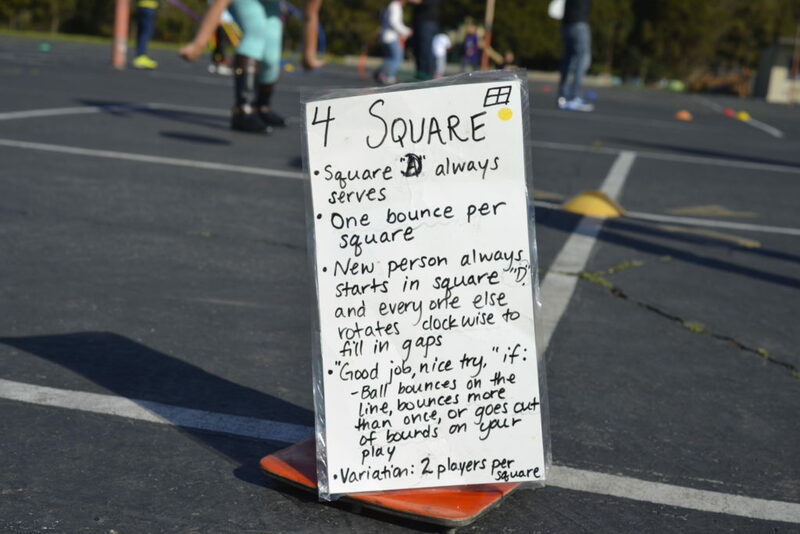 Adults can also model how to play by the rules (e.g., demonstrate an “underhand” hit for four square). When disagreements between students occur or when a student is not following the rules, an adult can ask a student to read the rules out loud. Use the playground map to identify game stations. Check to make sure that each game station has sufficient space to avoid safety risks and prevent game interference. This helps games run smoothly and keeps kids engaged. Use colored cones or chalk to draw clear boundaries for each game station. Check to make sure that any safety hazards on the playground, like a tree stump at the edge of the grass, have been clearly marked. Then, make sure no game stations are to close to the location of the hazard. To make sure kids know where they can play, ask students to trace the boundaries of their game in the air (using their fingers) before beginning the game.